Rambling Mom: A Wonderful Christmas Gift! This was the present we surprised our parents with this Christmas. Yep, that last spot says 'Baby'! I found out the day before my birthday a few weeks ago that we are expecting baby #6. 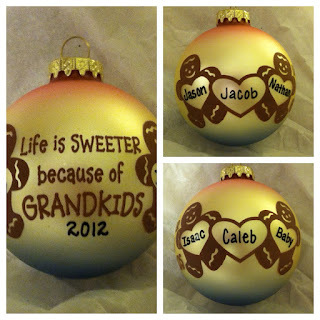 It was really fun to surprise the grandparents with these cute ornaments (got at Bronner's Christmas Wonderland, love them!) and see how quickly they caught the change. So far I'm feeling pretty good. I've started to get a little bit of nausea this week, though it didn't interfere with Christmas. The boys are really excited about the baby. I told Jakey when we were at the inlaws and he went out of the room to Grandma Cindy and said, "Guess what Grandma? In August my mom is going to have a baby! Or maybe two!" I burst out laughing at that. We don't know yet how many there are, guess we'll see lol. And Jason told me today that he really wants it to be a girl because four brothers is enough. I'm so excited for this baby and can't wait to start feeling it move and see it on ultrasound.